Chin augmentation, also called chin enlargement surgery is usually chosen by patients, in whom we can observe misshapen and asymmetric chin. 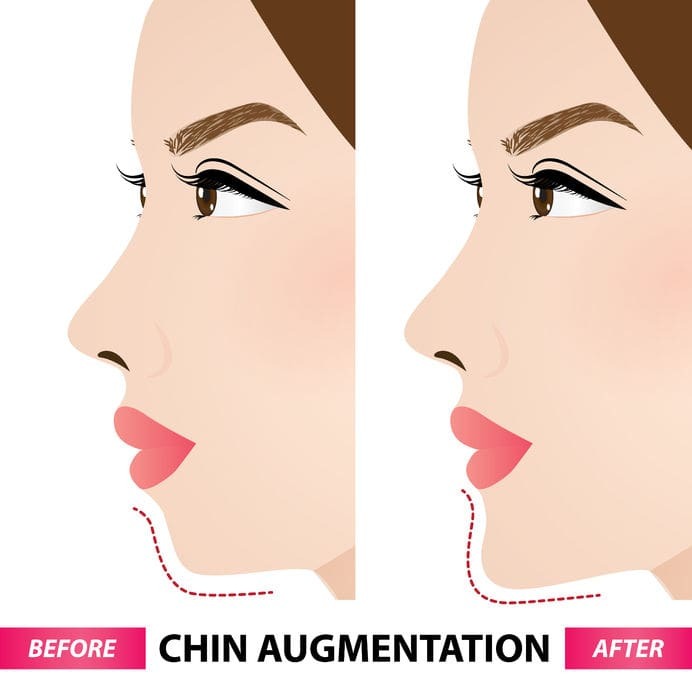 By carrying out this procedure we aim for such chin modeling, so that we achieve the harmony between chin and the rest of the face.Chin enlargement is, in most cases, chosen together with nose correction surgery (rhinoplasty). Before the surgery patient arrives in for the medical consultation with the plastic surgeon, during which all the techniques of the procedure are being discussed. Silicone prostheses are usually used with this type of treatment, despite the fact that nowadays implants made of different materials have become popular. The procedure involves performing an intra cavity infiltration near the gum (any possible scars resulting from the treatment will be invincible), where something like 'pocket' is being created, for later use of prothesis implementation. This type of chin enlargement has been recently the most popular technique. The treatment involves injecting hyaluronic acid into the corrected chin area directly. This type of treatment is, however not permanent, and it serves patients mainly as an overview material for results, which they can achieve by carrying out a traditional treatment. This treatment involves placing of a bone part in the appropriate place, which earlier was transplanted from other part of the body. This bone needs to be reshaped for chin. Only patients with impeccable health can be qualified for this type of surgery and what is very important, patients whose bones development has been finished (usually after 18-20 years of age). It is essential so that alcohol consumption and smoking is limited before the surgery. Another important fact that the surgeon must be informed about during medical consultation, is having any ailments and health problems. Before the chin enlargement surgery all the necessary test will be carried out in order to verify patient's health condition. Chin enlargement correction is usually performed within 1 day using local anesthesia (rarely general anesthesia is used). The final decision will be made during medical consultation with the surgeon. Apart from medical consultation with the surgeon, there will be pre-booked a consultation with an anesthesiologist. Chin enlargement surgery usually lasts 1 to 2 hours, but the exact duration is dependent on the chosen technique and hospitalisation usually lasts no longer than 12 hours. After the surgery there are planned follow-up visits aimed for monitoring of patient's health and condition. Possible post-operative pain afflictions are effectively eliminated by applying suitable painkillers prescribed by the surgeon. After the surgery possible to occur are: irritation, swellings and increased sensitivity around operated areas.